After two strong episodes that shows Guardians of the Galaxy at its strongest and most propulsive, “Don’t Stop Believin’,” for some reason, decides to kill that narrative momentum dead. Steven Melching scripts tend to be scattershot and a bit listless–rich with potential but never really managing to do much with the core idea of its premise (he also clearly prefers Rocket over the rest of the cast). I get the sense that the creatives needed to pad an episode in order to fulfill the season order, but handing that job to Melching was not the best choice, as he seems to have come up with a basic, sensible idea–a mysterious woman named Mantis manipulates the Guardians in order to get close enough to the king of Spartax to kill him–and completely fail to figure out how to make it compelling, or even interesting. We don’t even meet Mantis until the end of the first act. Prior to this, the Guardians arrive on Spartax amongst giant crowds and long lines, similar to an airport. The idea behind this is cute, and sure, seeing a brief, sitcom-esque, comedic approach to the crowded airport scene could be nifty, in intergalactic alien terms. But Melching fails to commit to his bit, opting for a “whoopsie” moment (one of Rocket’s weapons destroys a statue of their king) that leads to them trying to be captured. So they end up fighting off guards through the airport and the luggage terminals. Again, a large, planetary-scaled version of First Blood would fit Guardians perfectly for a full episode, but nope! We’re on to the next part. That’s the thing: “Don’t Stop Believin’” is just a bunch of brief, segmented bits pasted together. There’s no flow, no real theme or single plot point that works through the entire episode. Each segment works fine on its own and certainly has the potential to be its own episode, but they’re never given its time to work, which kills the narrative momentum each and every time. The escape from Spartax security is followed up by a small “find Peter” mission, but then that becomes a knock-off Legend of Korra battle with the magic security of the king’s palace, struggling with rooms that attempt to kill the team with the “four elements” of fire, air, earth, and water. It’s fine to watch each member use their individual skills to turn off the room’s traps (Drax’s method was particularly awesome), but then, it’s over. 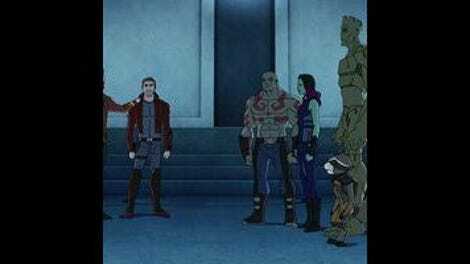 A whole episode could have been built around the Guardians figuring out the palace’s traps to save Peter while comically bonding. We just get a fifth of one. I think there’s something to be said of the Guardians doing just fine without Peter at the helm. Again, there’s a potential conflict, or theme, or idea, about how much Drax, Gamora, Groot, and Rocket really need Peter–who rushed off at the beginning and left them to fend for themselves–and how they managed just fine without him, but Melching doesn’t even hint at recognizing this. Nor does the script do anything with Mantis, who seems to be some kind of zealot trying to take out the king. It’s unclear whether she was manipulating the Guardians on purpose, or just confused about their true intentions and just worked with them regardless, but really, Mantis is a complete cypher of a character. It’s never revealed who exactly she works with, why exactly she wants to kill the king, what her powers are, or even who she as a person (I mean, she says she’s a member of the “Universal Believers,” but, who are they?). I liked that her constant whining about “believing” and “prophecy” is mostly ignored, but this isn’t an episode that seemed particularly interested in dealing with any notion of belief, or satirizing the whole “prophecy” concept with any real conviction. All the stuff that happens in this episode is obvious padding and meandering; the final three minutes is where the good stuff happens. 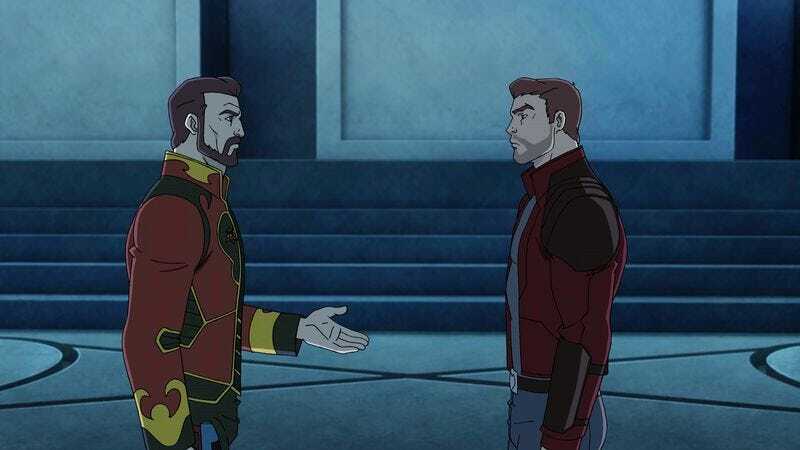 Peter finally meets his father, King J’Son (voiced by Jonathan Frakes!) and realizes he’s Spartax royalty. The twist here is that J’Son is actually working for Thanos, which would have had more of an impact if the episode was, you know, about Peter. “Don’t Stop Believin’” really isn’t about anyone or anything. It’s a grab-bag of moments and sequences, which would be fine if the episode looked great or was at least narratively consistent. The core characterization of the characters are locked into place though, which is worth something (Gamora’s wisecracks are slowly winning me over); if all the writers could get on board then this show could finally click into place. Were the Guardians’ dismissals of Mantis’ whines about belief and faith suppose to be a bit of shade thrown towards religion in general? Or at least the fundamentalism side to it? I’d rather see the show try, and botch, the attempt than completely make it vague and meaningless. Rocket’s “Oh, really? He’s your father, dummy!” line read was probably the best line reading from an animated cartoon I have ever heard, and I watch a lot of cartoons. Seriously, that alone bumped up the grade from a C+ to a B-. The animation was sloppy this episode, which might be appropriate: listless visuals matching a listless script. I guess the Universal Believers will be more important later on, but with the Cosmic Seed, the Asgardian element, the J’Son betrayal, and the various outside conflicts with the Black Order, Ronan, etc., this may be too much for the show to handle. If this was The Venture Brothers I’d trust the show to handle all those narrative threads. This is decidedly not the Venture Brothers.